Other than the books authored by me, the following is a list of my diagrams and articles that appeared in various periodicals. Apr 2019 - British Origami Magazine #315. Nov 2016 - CalOrigami EBOC convention book. Nov 2016 - OrigaMIT convention book. Sept 2014 - diagrams available for purchase at Origami USAdownloads. The Fold Issue 50 published diagrams for my Super Simple Hearts. The Fold Issue 49 published diagrams for my Delicata. November 2018 - OrigaMIT convention book. October 2018 - The Fold Issue 48 . October 2018 - British Origami Magazine #312. 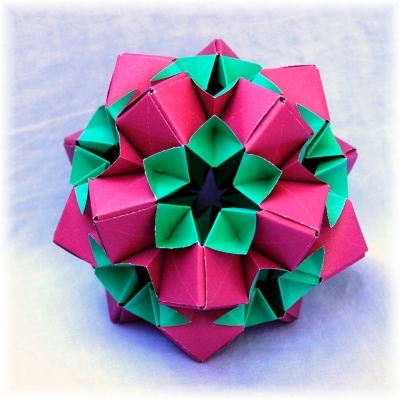 British Origami Magazine #312 published diagrams for my Pentas. 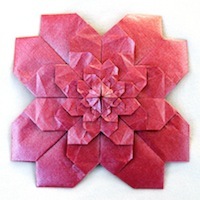 June 2018 - 17th Plener Origami Convention, Poland. Oct 2017 - Nippon Origami Association, Symposium Collection, Tokyo. Oct 2017 - The Fold Issue 42. June 2017: 16th Plener Origami Convention book, Poland. published diagrams for my Whirlwind and Majestic Mosaic. Dec 2016: 34th CDO Italy convention book published diagrams for my Centaury and Origami my Heart. Quadrato Magico #116 published diagrams for my Columbine. Dec 2016 - 34th CDO Italy convention book. Oct 2016 - Origami Mexico convention book. Nov 2015 - OrigaMIT convention book. Dec 2014 - CDO Convention collection. October 2016: The Fold Issue 36 published diagrams for my Patterned Pentakis Dodecahedron and Whirlwind. 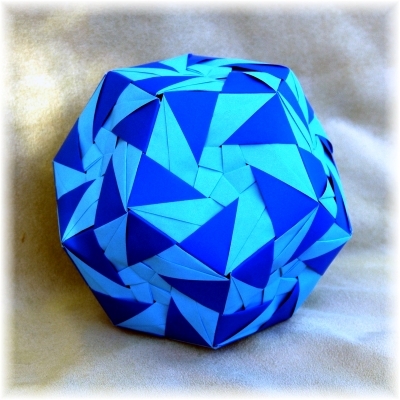 The Fold Issue 35 published diagrams for my Pentakis Dodecahedron. The Fold Issue 33 published diagrams for my Posy Sonobe. The Fold Issue 32 published diagrams for my Spring Beauty. June 2015 - OrigamiUSA Convention Book. The Fold, Issue 30 published free diagrams for my Mayur. The Fold, Issue 29 published diagrams for my Star of Wonder and Variation. June 2015 - Orison, Vol 31, No 3, Origami Sociëteit Nederland. April 2014 - British Origami Society Spring Birmingham Convention Collection. April 2014 - British Origami Magazine #285. Oct 2013 - 2013 Pacific Coast Origami Convention Book. The Fold, Issue 27 published my article titled "The Lesser Known Twin of The Sonobe Unit". November 2014 - OrigaMIT Convention Book. October 2014 - The Fold, Issue 24 (free diagrams). The Fold, Issue 23 published diagrams for my Hearty Cube. Orison, Vol 30, No 3, Origami Sociëteit Nederland published diagrams for my Gazania. The Fold, Issue 22 published my article titled "Folding the Tridecagon, that Odd Polygon". 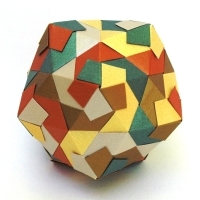 The Fold, Issue 21 published my article titled "Extending Kawai's Pentagon Method to a Decagon". May 2014 - Orison, Vol 30, No 2, Origami Sociëteit Nederland. June 2010 - Origami USA 2010 Annual Collection. 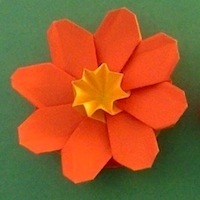 2010 - Polish Origami Association Bulletin #8. Nov 2013 - East Bay Origami Convention Book. April 2013 - The Fold, Issue 15. Dutch Origami Magazine by Origami Sociëteit Nederland published diagrams for my Whipped Cream Cube. May/June 2013 - 12th Plener Origami Convention book, Poland. Nov 2012 - East Bay Origami Convention book. Oct 2012 - Available for purchase through Origami USA file/diagram downloads. British Origami Magazine #280 published diagrams for my Simple Diamond. Playing Card Symbols available for purchase through Origami USA file/diagram downloads. British Origami Magazine #276 published diagrams for my Curly Locks. The Fold, Issue 12, published diagrams for my Curled Sonobe. 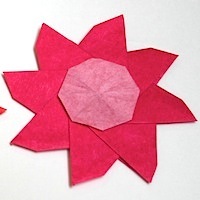 Origami USA Annual Collection 2012, published diagrams for my Poinsettia 2. May 2012 - Jong Ie Nara/Paper Land Plus Magazine Vol 10 (in Korean). April 2011 - British Origami Magazine #267. March 2012 - Origami_USA online magazine The Fold, Issue 9. February 2011 - British Origami Magazine #266. Origami USA PAPER magazine, Issue 107, published diagrams for my Dimpled Model with Curls. May 2011: 10th Plener Origami Convention Book, Poland, published diagrams for my Pinwheel Dodecahedron, Vortex Dodecahedron and Star Flower. Origami Sociëteit Nederland Magazine Mennorode 2011, published diagrams for my Daylily. 5OSME 2010 Convention Collection, Singapore, published diagrams for my Whipped Cream Star. British Origami Society Autumn 2009 Winchester Convention Collection published diagrams for my Simple Cubes. Origami Bolivia 2008 Convention Collection published diagrams for my Flower Cube model. British Origami Society Spring 2008 Nottingham Convention Collection published diagrams for my Blintz Base model. June 2008 - Origami USA Annual Convention Collection. Sept 2007 - British Origami Society 40th Anniversary Collection. May 2007 - French Origami Society MFPP Convention Collection. British Origami Society Autumn 2006 Bristol Convention Collection published diagrams for my Star Windows model. May-August 2003: Origami notable David Petty's website featured diagrams of my ten planar designs in Special Guest Folders. Centro Diffusione Origami Quadrato Magico #71 published diagrams for my Primrose Floral Ball. Scaffold Vol 1, Issue 3, published diagrams for my Thatch Cube. British Origami Magazine #315, Apr 2019, published my article titled "My Origami Story", Part 2. British Origami Magazine #314, Feb 2019, published my article titled "My Origami Story", Part 1. Quadrato Magico #119, Spring 2018, published Italian translation of my CDO 2016 convention report from The Fold Issue 42, Sep-Oct 2017. The Fold Issue 42, Sep-Oct 2017, published my 34th CDO 2016 convention report. 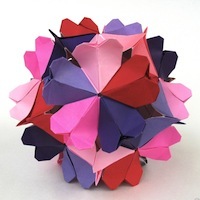 The Fold Issue 32, Jan-Feb 2016, published my OrigaMIT 2015 convention report. The Fold Issue 32, Jan-Feb 2016, published my CenterFold 2015 convention report. British Origami magazine #292, June 2015, published my Wonderfold 2014 convention report. The Fold Issue 26, Jan-Feb 2015, published my Wonderfold 2014 convention report. British Origami magazine #269, August 2011, published my article titled "My Polish Origami Convention Experience". Origami USA PAPER magazine, Issue 107, summer 2011, published my photo essay titled "Origami In Poland". Jong Ie Nara/Paper Land Plus Magazine Vol 6, 2010, has my article titled "An Afternoon With the Legendary Florence Temko" translated in Korean. Helma van der Linden utilized some of my sonobe work in her PhD Thesis "Connecting Healthcare Professionsal: Studies on a generic EHR system framework", 2009. Origami USA magazine Paper #100, February 2009, has my article titled "An Afternoon With the Legendary Florence Temko". British Origami magazine #253, December 2008, has my article titled "An Afternoon With the Legendary Florence Temko". Origami USA magazine Paper 97, March 2008, has my article titled "My Book Writing Experience". It also has a review of Marvelous Modular Origami and features a couple of my model photos.